As you get older you may be faced with more health conditions that you need to treat on a regular basis. It is important to be aware that more use of medicines and normal body changes caused by aging can increase the chance of unwanted or maybe even harmful drug interactions. The more you know about your medicines and the more you talk with your health care professionals, the easier it is to avoid problems with medicines. As you get older, body changes can affect the way medicines are absorbed and used. For example, changes in the digestive system can affect how fast medicines enter the bloodstream. Changes in body weight can influence the amount of medicine you need to take and how long it stays in your body. The circulatory system may slow down, which can affect how fast drugs get to the liver and kidneys. The liver and kidneys also may work more slowly, affecting the way a drug breaks down and is removed from the body. Because of these body changes, there is also a bigger risk of drug interactions among older adults. Therefore, it’s important to know about drug interactions. Drug-drug interactions happen when two or more medicines react with each other to cause unwanted effects. This kind of interaction can also cause one medicine to not work as well or even make one medicine stronger than it should be. For example, you should not take aspirin if you are taking a prescription blood thinner, such as warfarin, unless your health care professional tells you to. Drug-food interactions result from drugs reacting with foods or drinks. In some cases, food in the digestive tract can affect how a drug is absorbed. Some medicines also may affect the way nutrients are absorbed or used in the body. Side effects are unplanned symptoms or feelings you have when taking a medicine. Most side effects are not serious and go away on their own; others can be more bothersome and even serious. To help prevent possible problems with medicines, seniors must know about the medicine they take and how it makes them feel. Keep track of side effects to help your doctor know how your body is responding to a medicine. New symptoms or mood changes may not be a result of getting older, but could be from the medicine you’re taking or another factor, such as a change in diet or routine. If you have an unwanted side effect, call your doctor right away. All medicines count. Tell your team of health care professionals about all the medicines you take, including prescription and over-the-counter (OTC) medicines, such as pain relievers, antacids, cold medicines, and laxatives. Don’t forget to include eye drops, dietary supplements, vitamins, herbals, and topical medicines, such as creams and ointments. Keep in touch with your doctors. If you regularly take a prescription medicine, ask your doctor to check how well it is working. Check to see whether you still need to take it and, if so, whether there is anything you can do to cut back. Don’t stop taking the medicine on your own without first talking with your doctor. Medical history. Tell your health care professional about your medical history. The doctor will want to know whether you have any food, medicine, or other allergies. He or she also will want to know about other conditions you have or had and how you are being treated or were treated for them by other doctors. It is helpful to keep a written list of your health conditions that you can easily share with your doctors. Your primary care doctor should also know about any specialist doctors you may see on a regular basis. Eating habits. Mention your eating habits. If you follow or have recently changed to a special diet (a very low-fat diet, for instance, or a high-calcium diet), talk to your doctor about this. Tell your doctor about how much coffee, tea, or alcohol you drink each day and whether you smoke. These things may make a difference in the way your medicine works. Recognizing and remembering to take your medicines. Let your health care professional know whether you have trouble telling your medicines apart. The doctor can help you find better ways to recognize your medicines. Also tell your doctor if you have problems remembering when to take your medicines or how much to take. 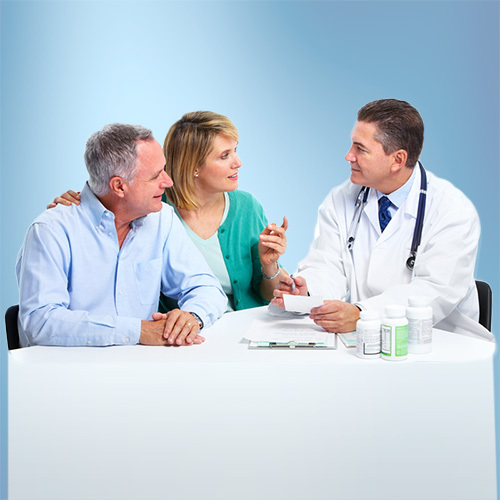 Your doctor may have some ideas to help, such as a calendar or pill box. Swallowing tablets. If you have trouble swallowing tablets, ask your doctor, nurse, or pharmacist for ideas. Maybe there is a liquid medicine you could use or maybe you can crush your tablets. Do not break, crush, or chew tablets without first asking your health care professional. Your lifestyle. If you want to make your medicine schedule more simple, talk about it with your doctor. He or she may have another medicine or other ideas. For example, if taking medicine four times a day is a problem for you, maybe the doctor can give you a medicine you only need to take once or twice a day. Put it in writing. Ask your health care professional to write out a complete medicine schedule, with directions on exactly when and how to take your medicines. Find out from your primary care doctor how your medicine schedule should be changed if you see more than one doctor. Keep a record of your medicines. List all prescription and OTC medicines, dietary supplements, vitamins, and herbals you take. Many pharmacists keep track of medicines on their computer. If you buy your medicines at one store and tell your pharmacist all the OTC and prescription medicines or dietary supplements you take, your pharmacist can help make sure your medicines don’t interact harmfully with one another. Ask your pharmacist to place your prescription medicines in easy-to-open containers if you have a hard time taking off child-proof caps and do not have young children living in or visiting your home. Remember to keep all medicines out of the sight and reach of children. Your pharmacist may be able to give you written information to help you learn more about your medicines. This information may be available in large type or in a language other than English. Should it be taken with water, food, or with a special medicine, or at the same time as other medicines? What do I do if I miss or forget a dose? Should it be taken before, during, or after meals? What is the proper dose? For example, does “four times a day” mean you have to take it in the middle of the night? Tell your doctor if you are worried about the cost of your medicine. Your doctor may not know how much your prescription costs, but may be able to tell you about another less expensive medicine, such as a generic drug or OTC product. Ask for medicine samples. If your doctor gives you a prescription for a new medicine, ask your doctor for samples you can try before filling the prescription. Try mail order. Mail-order pharmacies can provide medications at lower prices. However, it is a good idea to talk with your doctor before using such a service. Make sure to find a backup pharmacy in case there is a problem with the mail service. Buy OTC medicines when they are on sale. Check the expiration dates and use them before they expire. If you need help choosing an OTC medicine, ask the pharmacist for help.